Ironic and unusual furnishing, Silo by Studio Kairos is much more than a simple bedside table. Designed for utmost functionality, it is also an amusing and charming piece. It consists of a structure in thermally treated oak with a central leg based on a ray base unit. The top is in wood, folded with a C-shape thought as a supporting surface, and it hosts two built-in drawers or that can be used originally as storage units. Lema’s history is the tale of a Made in Italy that focuses on quality and customisation, wisely merging innovation and tradition. Its strength lies in its extraordinary manufacturing ability, typical Italian excellence, that allowed the firm to combine the values and technologies of a big industrial firm to outstanding craftsmanship skills, giving life to a large range of furniture. Great care is paid to each production phase, from design, thanks to the close collaboration with designers, to the final product. 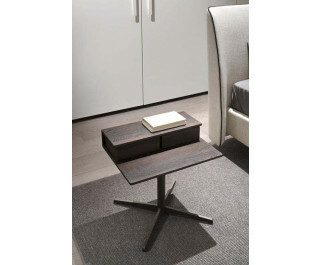 Indeed, the essence of Italian design and the marvellous way in which Lema interprets it, lies in attention to quality. The common thread that binds all the products of the assorted catalogue is comfort and harmony of slow living. Cosiness and conviviality, relax and warmth are in fact the key words. Lema was founded in 1970 by the Meroni family, that is still managing it, strong of a tradition dating back to the ’30s. In the ‘40s, the first store was opened in Milan where, driven by the current boom, the meeting with the first architects and designers, that had just began working at national level, had a key role in driving the production towards more contemporary aesthetics. Among the first collaborations, that with Angelo Mangiarotti was extremely significant, who was entrusted the design of the Alzate branch in the ‘70s by the sons of founder Angelo, Luigi and Enrico, with the aim to start an industrial production. Lema was the first Italian company to develop a load-bearing side-panel system in various finishes and the made-to-measure wardrobe, custom-made for the client. Iconic products that witness Lema’s attention to the customer and great customisation ability, typical characteristics of the firm. Today the Group consists of the divisions Lema Casa, Lema Contract and International Office Concept dedicate to office furniture.